For the first time ever on May 4th at 10 AM GMT+2 we will be live-streaming the drawing for the group the servers on the official Travian: Legends Facebook page. 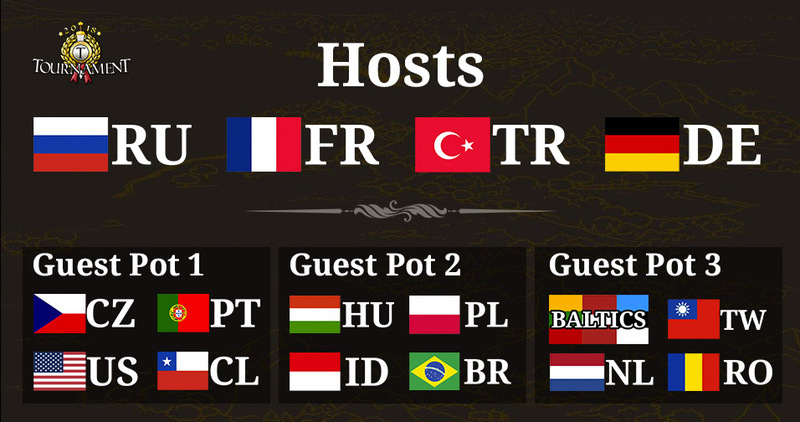 We will randomly allocate one guest country from each pot to each of the host’s group servers and we won’t be doing it alone. Our esteemed player guests from the Legends on Tour will be joining us for this historic event! So save the date! Tune into our FACEBOOK LIVE STREAM on Friday MAY 4th at 10:00 AM GMT+2 to see which countries will be battling it out in the qualification round. Leave them in the comments and we’ll try to answer it on the live steam! So when the qualification servers start? Hello, maybe you can replace romania and czesz with italy and balkan? What tribes will we be able to play? Will the new Huns and Egyptians be available? Hello. I think USA should not be a Guest country, when they speak in English and they could play in International server. I also do not understand why you do not merge Brasil and Portugal together when these country play like 1 united nation. If you do that there will be 2 more Guest spot for other country. When is the pre inscripción?? There will be no Pre-registration. Registration will be open when the servers open on the 13th of June. When the registeration for qualification servers will start? I read some where in your blog that the qualification round will start 14th June 2018? Morning? Evening? Or is the hour the top secret? The servers started at 14:00 GMT+2 yesterday. Unfortunately, we did not have the exact time of the server start when we published this blog. For the latest news and updates, make sure you follow us on Facebook.